Designed for Cat. I or Cat. I Quick Hitch these heavy-duty models have the strength required to handle the tough jobs. 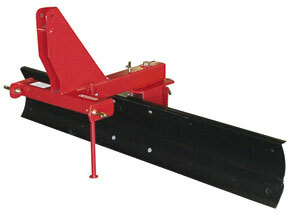 The main frame consist of an all welded mast and 4" x 4" square tubing. The RBHD-Series features mechanical offset and angle adjustment. Angle adjustment is done by simply removing a pin, angling the blade and reinstalling the pin. The RBHD-6-T and RBHD-7-T utilize a 3-position tilt assembly that is easy to use. All models have areversible cutting edge and are supplied with a parking stand for convenient storage. Available options are skid shoes to assist in cutting height adjustment to reduce the chance of surface damage during snow removal. Optional end plates provide a boxed area for grading. Frame Size: 4 in. x 4 in. 4 in. x 4 in. 4 in. x 4 in. 4 in. x 4 in. Moldboard Width: 6 ft. 7 ft. 6 ft. 7 ft.
Moldboard Height: 14 in. 14 in. 14 in. 14 in. Moldboard Thickness: 1/4 in. 1/4 in. 1/4 in. 1/4 in. Cutting Edge (Reversible): 1/2 in. x 6 in. 1/2 in. x 6 in. 1/2 in. x 6 in. 1/2 in. x 6 in.